This is the vinyl release of one of surf music's more unusual artifacts. 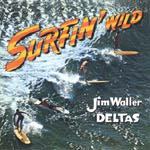 Jim Waller and the Deltas were from Fresno, and were struck by the surf bug via the "assistance" of Tony Hilder. Waller was a jazz keyboard player, and so his brand of surf was more in tune with his taste than the genre at large. Heavily piano / organ / sax oriented and R&B - lounge jazz based, some even hinting of Perez Prado. There are a couple of really cool things here. For one, the jazz guitar version of Latin'ia is the best version ever, next to the Sentinals' original. For another, their jazz edged rendition of the Rhythm Kings / Sentinals Exotic is nothing if not inspired. They were a bit like taking the whole surf idiom, and inverting it. One last note. Many surf movies were accompanied by jazz, either from phonographs at showings, or later on their soundtracks. This music would have fit right in.